Korektor is a statistical spellchecker and (occasional) grammar checker released under 2-Clause BSD license and versioned using Semantic Versioning. 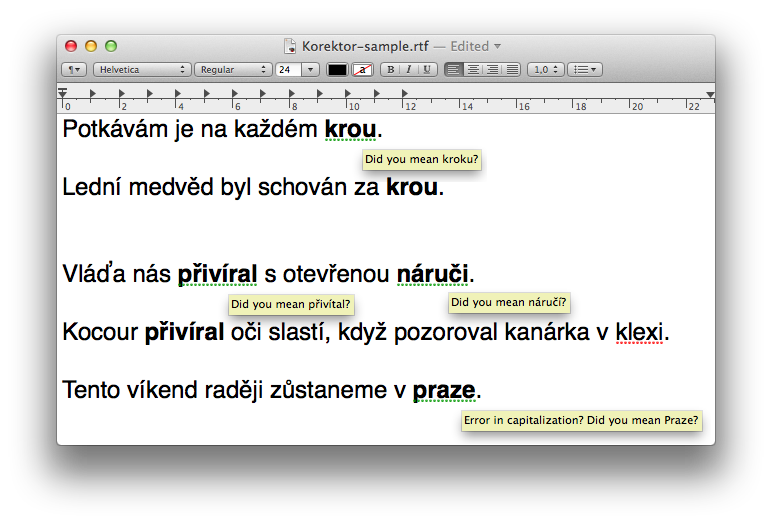 Korektor started with Michal Richter's diploma thesis Advanced Czech Spellchecker, but it is being developed further. There are two versions: a command line utility (tested on Linux, Windows and OS X) and a REST service with publicly available API and HTML front end. The original OS X SpellServer providing System Service integrating Korektor with native OS X GUI applications is no longer developed, but do not hesitate to contact us if you are interested in it. Copyright 2015 by Institute of Formal and Applied Linguistics, Faculty of Mathematics and Physics, Charles University in Prague, Czech Republic. Korektor releases are available on GitHub, either as a pre-compiled binary package, or source code packages only. The original Michal Richter's version can be downloaded here. Korektor is an open-source project and is freely available for non-commercial purposes. The library is distributed under 2-Clause BSD license and the associated models and data under CC BY-NC-SA, although for some models the original data used to create the model may impose additional licensing conditions. If you use this tool for scientific work, please give credit to us by referencing Korektor website and Richter et al. 2012. Korektor Installation on separate page. Korektor User's Manual on separate page. Korektor Model Creation on separate page. Acknowledgements for individual language models are listed in Korektor User's Manual page. (Richter et al. 2012) Richter Michal, Straňák Pavel and Rosen Alexandr. Korektor – A System for Contextual Spell-checking and Diacritics Completion In Proceedings of the 24th International Conference on Computational Linguistics (Coling 2012), pages 1-12, Mumbai, India, 2012. If you prefer to reference Korektor by a persistent identifier (PID), you can use http://hdl.handle.net/11234/1-1469.